I Was a Green Beret draws attention to the book world around us and painstakingly coaxes it into being through the miniature style of painting. Orion Shepherd’s paintings are an achievement of trompe l’oeil and the portrayal of dimension, yet his greatest output is the depiction of the 60s era at the peak of popular imagination. While his current study of books and magazines condense the cover onto the page, they also capture the magnitude and complexity of the media culture from which they originate. Showing for the first time at Adobe Books, Orion Shepherd creates a focal point for the fascination and compulsion of the United States Army Special Forces and the clandestine operations of the Green Beret. Functioning as a provocation of the Green Beret, the exhibition pairs the dramatic device with other print media saturations through a pastiche of book cover designs. As a result, Shepherd’s new body of work not only rekindles the history the codex and its decorative uses, but more significantly, reveals miniaturization as both a mode of virtuosity and haunting social process of identity formation as demonstrated by the Orwellian dystopia in 1984, the guiding hand of National Geographic and The Right Stuff’s ethos of patriotism. Orion Shepherd was born in 1984 and grew up in Martinez, California. He received his Bachelor degree in Fine Arts from California College of the Arts (CCA) in 2006. Shepherd currently lives and works in San Francisco. Adobe Books is pleased to present Orion Shepherd's solo exhibition alongside the gallery's history of showcasing local emerging artists. 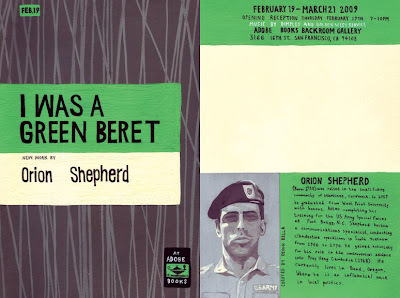 I Was a Green Beret is especially exciting for Adobe Books as many of its own paperbacks inspired Shepherd's new body of work. Sam McPheeters was born in Ohio in 1969, and raised in upstate New York. He is the former lead singer of Born Against and Wrangler Brutes, a founding member of Men's Recovery Project and the owner of the now defunct Vermiform Records. He lives in California with his wife, Tara, and their eleven cats. 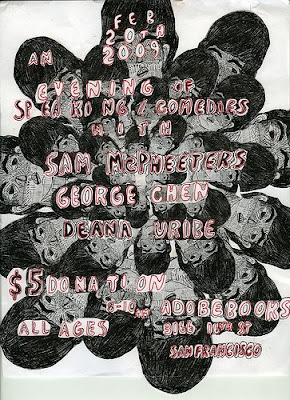 George Chen is a freelance writer and musician based in Oakland. Music projects include Chen Santa Maria, KIT, 7 Year Rabbit Cycle, and running the record label Zum. He has performed "stand up" "comedy" about "five" times, all since seeing the terrible, terrible "Indiana Jones and the Kingdom of the Crystal Skull". Deana Uribe is a poet, comedian, and student from Los Angeles California. She has performed stand up comedy twice, the first time at the Playhouse 7 Laemmle Theater in Pasadena and the second time at the Horsecow Gallery in West Sacramento. Her perfomances consits of elaborate long stories dashed with Satanic-stoner references. She lives in Felton, in the Santa Cruz mountains.